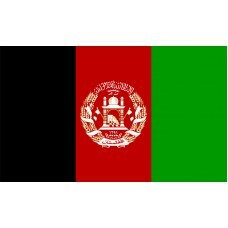 The Afghanistan flag is made up of three equally sized bands of color that run vertically down the flag. The colors are from left to right; black (signifying Afghanistan's troubled past), red (represents the blood lost through the fight for independence) and green (can be interpreted as representing prospering agriculture, Islam itself or future hopes for Afghanistan). 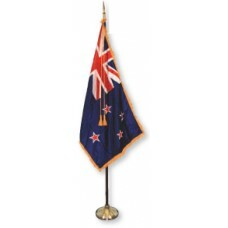 In the center of the flag is a printed emblem in white that slightly overlaps into the bands of color on either side. A mosque is the main feature on the emblem with flags and pulpit on either side of it. Underneath the image of the mosque numerals appear representing the solar year of 1298 which represents the Gregorian calendar year of 1919. This was a very important year for Afghanistan as it was the year they gained their independence from the United Kingdom. A circular border surrounds the image featuring wheat sheaves on both sides. An inscription of Muslim creed (the Shahada) appears in the top center of the emblem and underneath displays sun rays where the sun is depicted to be rising over the Arabic expression (Takbir) which means "God Is Great". Centered at the bottom of the emblem is the name Afghanistan which appears within a scroll. The Afghanistan flag has changed more times than any other country's flag, currently sitting at a total of 26 flags, 19 of which were during the 20th century! 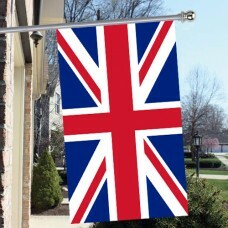 The first flag recorded was when the Hotak Dynasty established in 1709. The Hotak Dynasty was a monarchy of Afghan created by Miriwais Hotak who led a victorious revolution against the Safavid (Persian overlords) in what is now referred to as the southern part of Afghanistan. 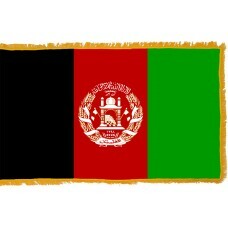 The majority of the Afghanistan flags have retained the same color scheme of red, green and black over the years. The current flag represents the Islamic Republic of Afghanistan and is similar in appearance to the country's flag of 1930 to 1979. The current flag however, was established in 2013 on the 19th of August. There are only four state flags other than the current Afghanistan flag to feature a building, the other flags being the Sammarinese flag, the Cambodian flag, the Spanish flag, and the Portuguese flag. Afghanistan itself is a multi-ethnic country which is completely landlocked and located in the southern part of central Asia. It's strategic location which connects Eastern and Southern Asia to the Middle East and Europe has made it highly sought after throughout history by those looking to build strong empires whilst gaining access to trade routes of great importance. The landscape in Afghanistan is unforgiving with mountains and deserts aplenty and the intense heat of the summer sun which can reach temperatures well into the forties. The people of Afghanistan are very independent and as such, over the years there have been many wars and unrest as well as ever changing leadership and alliances.